Why did I buy the Focusrite? 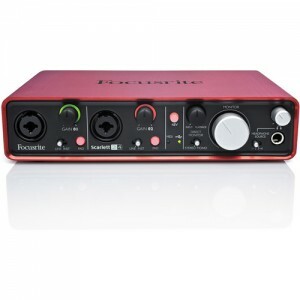 I bought the Focusrite Scarlett 2i4* (2i4 on B&H | 2i4 on Amazon) after my beloved Griffin iMic died on me after a few years of hearty service. The iMic is a simple, small audio interface that accepts both line and mic. level sources with a 3.5mm connector and it does its job really well. So why not just buy another one? I was going to but I’m a gear junky so upgrading is common place. The iMic is a little pricey for what it does ($35-$40) but again it’s well worth it. The price of the iMic led me to see what I could get if I invested a little more and I’ve been wanting to try the Focusrite series of audio interfaces for a very long time. This was my chance and a better justification for finally getting one. If I tripled my investment in a new iMic (give or take), I could get a lot more capability and power from the 2i4. In the audio (above) you heard my very first recordings using the 2i4. I plugged in my ATR2100 and recorded using Adobe Audition. The first same is raw (as recorded) and the second was lightly processed and loudness normalized. Primarily I use an audio interface to get a better soundcard than what is native to my computer (iMac) while at the same time giving me easy access to an input and output which gets used often for headphones and/or taking audio out of the computer into an audio recorder such as the Tascam DR-60D (this is how I record Podcasters’ Roundtable). At times, an audio interface also allows me to easily input any mixer or processing gear, such as my DBX286s into my computer. I normally record directly into an audio recorder but in situations requiring me to use software, being interviewed via Skype or recording a live-stream, the ability to easily input analog gear is a nice upgrade from a simple USB microphone. The main goal of this first test was to test the preamps on the 2i4. I’ve heard great things about the quality of the preamp, allowing you to use it at its max (+55db on the 2i4) without introducing noise created by the device. I found this to be true which makes me very happy. As you’ve seen or heard in my sub $100 mixer shootout, when the preamp is bad the test is over. With plenty of affordable interfaces having strong, clean preamps these days, there’s just no need to fight with one that creates unwanted noise. Beyond the preamp, one of the first things you’ll notice, if not the first, is it’s build quality. The 2i4 has a thick aluminum casing (red) that gives you the feeling of a quality made device while still remaining light and portable if necessary. This thing feels like it would travel well and could withstand some dents and dings (that remains to be seen). The knobs feel good despite being plastic. They have a satisfying feel when adjusted and the buttons and switches feel like they’ll hold up. Based on my perception of the quality of Focusrite, I can say that I expected these to all feel a little bit more “pro,” like something Apple would make; you know that weird way that Apple makes a button or click feel very satisfying and well made? The Scarlett’s knobs, buttons and switches are all fine but not exactly what I expected. Add to this, the dual (Neutrik) XLR/line inputs do not lock and when you plugin either XLR or a line input the click that tells you it is in all the way is minimal. I’m not concerned with any inputs falling out of the device but again (unless they were kicked out, etc), I’d prefer better tactical feedback when inserting inputs. That said, these are very small criticisms that border more on subjective preferences than actual problems with the device. Overall it’s built very well. The interface is bus-powered so there is no on/off switch. If it’s plugged in via USB, it’s on. It’s definitely nice to not have to deal with an additional wire or have a need for batteries or plugs. The 2i4, at the time of purchase, was only ten dollars more than the 2i2. However it appears I had good timing and caught a great sale as the regular price is usually fifty dollars more than the 2i2. While the sale price was enough reason for me to choose the 2i4 over the 2i2, most important to me was the bump in preamp power (gain) that you get. The 2i2 provides +45db while the 2i4 gives you +55db. Ideally I prefer at least +60db of gain available from my preamp but +55 is close enough and I was able to power the ATR2100 (a gain hungry dynamic) with some gain left over. You also get two additional stereo line outputs (RCA) as well as midi inputs (which I’ll probably never use), a direct monitoring option to prevent latency in your headphone monitoring and selectable sources for which output to monitor. As well there is an option to select stereo or mono when monitoring. This splits the two channels to the right and left speaker. I wish the gain knobs had some numbering which indicated exactly what db level you were setting them to but they do have a unique LED that encompasses the knob, displaying a green colored ring when levels are good which then turns amber then red when you’ve overloaded the preamp (peaked/clipped). And since I’m on a Mac, the 2i4 is plug and play. No drivers necessary, it just works out of the box. That’s a really nice feature for Apple users. But if you’re on Windows you’ll want to go out to the website and download the latest software in order to ensure that the device is up to date and fully capable. So far so good. I’m powering my microphone cleanly with no noticeable noise being created by the device either while recording or monitoring through the headphones. All preamps on the 2i4 appear to be high quality. The Focusrite is well built and looks great on your desk while appearing to be very easy to travel with. You could throw this device into a backpack along with a computer and some recording software and produce a high-quality sounding audio show with two XLR microphones.. This is an evolving post and I will add to it as I put the 2i4 through more tests to include recording with my Heil PR40, multichannel capabilities (doesn’t appear to do true multichannel), different sample rates (24-bit, 96 kHz capable), etc. 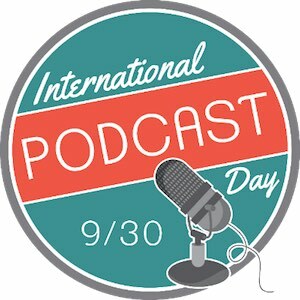 Sign up below to be notified when updates have been made or subscribe to The Podcasters’ Studio podcast to hear periodical updates via the show. I bought this primarily to replace my simple iMic audio interface. I wanted to test it out and upgrade the ability to input and output audio from my computer. Success. But who is the 2i4 really for? Would this work in your podcast setup? If you are using it like me, yes. It’s fully capable and probably overkill but it’s really nice having all it’s various options and high-quality. For anyone else, those just starting a podcast, this appears to be a great device for getting, up to two, professional level, XLR microphones into your computer. It has enough gain to power my ATR2100 as well as my Heil PR40 but would probably struggle with a microphone like the Shure SM7b. So if you had most any XLR microphone (dynamic or condenser) the 2i4 would be a great option to record audio into your computer or you could even send the signal back out of the 2i4 and into an audio recorder. 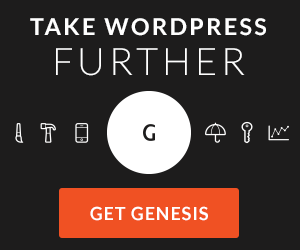 Used in both capacities, at the same time, you’d have an excellent back-up system. Why the 2i4 instead of a mixer? 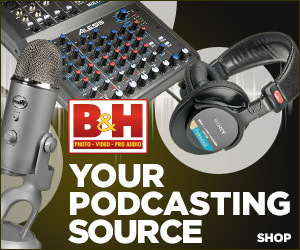 A mixer might just be overkill for many podcasters. However, if you need to how-to setup a mix-minus, you would want to go with a mixer that has at least one auxiliary send as the 2i4 does not have this capability. That said, you could probably create a software based mix-minus if needed. USB input. Disappointedly it doesn’t appear that the two channels can be separated onto their own track while recording. Despite being USB2.0, the 2i4 outputs a stereo signal. It will however isolate the two mic. inputs left and right which will allow you to create two separated tracks in post-production. UPDATE: Good news, the 2i4 does send multitrack for each of its outputs if your software supports it. 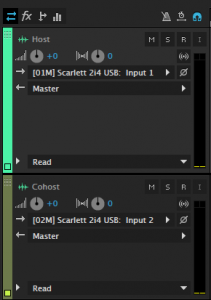 For instance, in Adobe Audition simply select the input/output section in your multitrack project (represented by small arrows going left and right above track 1. Seen here in blue) and choose input 1 from the 2i4 for track 1 and input 2 for track 2 (see image). However, Skype will only recognize input 1 from the 2i4. This can be either an advantage or disadvantage. If you want to use two microphones for Skype or any additional audio coming from input 2 on the 2i4, that will not work with Skype. However, this could allow you to loop audio out of your computer’s headphone output and into input 2 on the 2i4 which you could then record into software (like described above with Audition) giving you your microphone and your Skype guest their own track of audio in your software. Thanks to @theramennoodle for that idea. I have yet to try this out. At the 2i4’s price point, it’s debatable which option is better, mixer or interface? I think the Focusrite is probably more travel friendly for mobile or on-location audio recording but I found several mixers in the same price range that have equally good preamps. That said, not many of those mixers are USB capable and equal to the build quality of the Focusrite. So as always it depends on your individual needs. I like the 2i4 for what I bought it to do… be a high-quality, flexible audio interface. If you decide that the the 2i4 meets your needs, I’m already confident in saying that it will get the job done well.